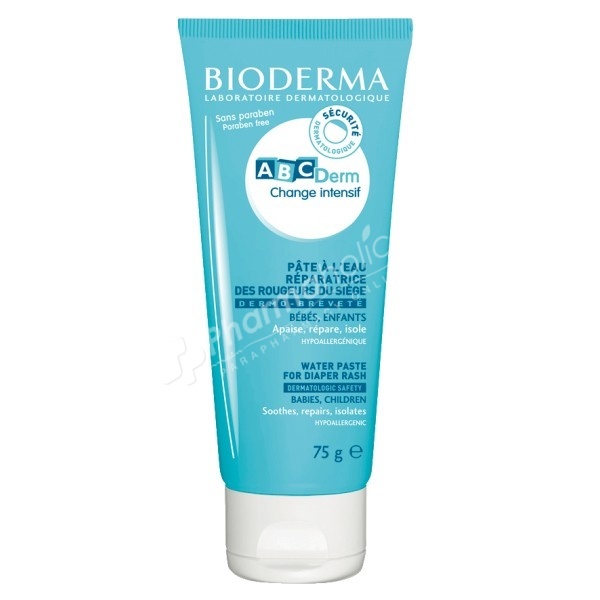 Bioderma ABCDerm Intensive Change Water Paste has been specifically formulated in accordance with the ABCDerm Dermatological safety commitment to repair and soothe diaper rash in babies and children. D-Panthenol quickly relieves redness and discomfort. It heps to repair the skin barrier by accelerating epidermal reconstruction. A water-base paste with a high concentration of Zinc Oxide, ABCDerm Intensive Change provides a non-occlusive active barrier. Easy to spread, odour-free and non-greasy, it is easily removed at the next cleansing and does not stain. Apply a thick layer with each diaper change, on skin that has been cleansed with an ABCDerm hygiene product, and dried thoroughly. Aqua, Glycerin, Zinc Oxide, Kaolin, Butylene Glycol, Talc, PEG-800, Panthenol, Titanium Dioxide (CI 77891), Hydroxyethylcellulose, Capryloyl Glycine.